Does the name Monty Python still mean something to those under 20? In my day, Monty Python sketches were an inextricable part of everyday discourse. This was despite the fact that, as a result of the cultural boycott of apartheid, the original BBC programmes were not readily available. Fortunately, Jood maak plan, as the saying goes. My mates were always able to get hold of pirated copies, including even of Monty Python’s Life of Brian, banned as sacrilegious by the old regime. Reg: They’ve bled us white, the bastards. They’ve taken everything we had, not just from us, from our fathers and from our fathers’ fathers. Stan: And from our fathers’ fathers’ fathers. Stan: And from our fathers’ fathers’ fathers’ fathers. Reg: All right, Stan. Don’t labour the point. And what have they ever given us in return? Reg: Oh yeah, yeah they gave us that. Yeah. That’s true. Masked Activist: And the sanitation! Stan: Oh yes … sanitation, Reg, you remember what the city used to be like. And so it goes on, much to Reg’s exasperation. Pre-Roman Judea was not, perhaps, quite as primitive as the skit would suggest, but the point is made nevertheless. Roman imperialism was not just about plunder, slaughter and enslavement. It brought lasting benefits to the subject populations as well. 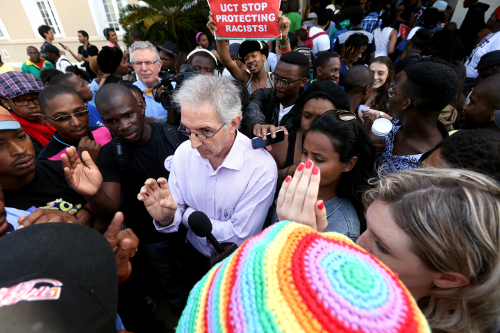 Which brings us to the uproar over the statue of Cecil John Rhodes at UCT, and how this in turn relates in general to the vexed issue of how South Africans should be dealing with the legacy of European colonialism. Views on the Rhodes statue are predictably polarised. In truth, it is a fiendishly complex issue. The Star editorial left no doubt where the writer stood on the matter, succinctly laying out the standard post-colonial “case for the prosecution”. Rhodes in this analysis is depicted as a rapacious, conniving, racially arrogant and ruthlessly predatory capitalist gangster responsible for the deaths of tens of thousands and the dispossession of millions of indigenous black Africans. Nor is there any shortage of evidence to support this view. For that, one needs look no further than how Rhodes and his British South Africa Company cheated the Matabele Chief Lobengula out of his country (henceforth to be combined with other colonised territory to form Southern Rhodesia — today’s Zimbabwe). So back and forth it goes, with the exchanges almost invariably permeated throughout by racially-charged anger, resentment and suspicion. My own tentative view is that Vice-Chancellor Max Price’s suggestion that the statue be moved to a less prominent part of campus is probably the way to go. However, this should be a considered, properly debated decision arrived at following wide consultation; it cannot be perceived as a caving in to threats and intimidation. I, for one, do not share the commonly held view that it is especially important to lend weight to the views of the youth. Letting them blow off steam, within reason, is one thing, but they should certainly not be allowed to dictate to those entrusted with maintaining and safe-guarding our academic institutions. My real concern about the whole issue is that once you start with C J Rhodes, where do you stop? Statues and other monuments to white South Africans — politicians, soldiers, business leaders and pioneers of every kind — are scattered in abundance throughout South Africa’s cities, towns and dorps. Were each and every one of these to be subjected to close critical scrutiny, it would emerge that almost all the historical personages commemorated were to some extent or other instrumental in the dispossession, repression and exploitation of the black majority. Must these monuments likewise be removed from all public spaces? The question becomes even more fraught when addressing the question of black historical figures who, like it or not, could also be said to have perpetrated the same kind of outrages. Was not Shaka, at the end of the day, an imperialist who through his military might crushed, dispossessed and forcibly subjected innumerable black Africans in creating his kingdom? All in all, perhaps the wisest course is to adopt a “let sleeping dogs lie” approach while ensuring that all future monuments more equably reflect the views and values of the South African people as a whole.